Last chance to register to the 2017 eucen Autumn Seminar! 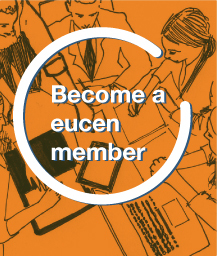 eucen's General Assembly took place on Friday 09 June 2017. The meeting started with the approval of the Minutes from the previous meeting, followed by the President's report, the update on membership, closing of the 2016 accounts and acceptance of the budget 2018. We are pleased to welcome 7 new members that were accepted during the General Assembly as well as the new Steeting Committee group elected in Mainz. The ApprEnt project has been accepted!